We live in strange times. One in 3 people around the world are overweight, and around the world 24 percent of calories are wasted between the farm and the refrigerator. That number jumps to 42 percent for folks in the U.S. Meanwhile, some 805 million people in the world (1 in 9 of us planetary residents) do not have enough food to lead a healthy, active life: abundance and scarcity, hand in hand. The reasons for this dichotomy are numerous, and the solutions complex. But one berry farmer hopes to tackle it with industry leadership and smart water management. J. Miles Reitner, chairman of Driscoll's Inc., spoke from the plenary stage at the 2015 Ceres conference about his company's efforts to lead the way on smart water use and the best growing conditions for strawberries. "There's a very specific climate for strawberries," Reitner said. "Coastal valleys are perfect. [Driscoll's operates] in 21 countries, and none of the growing environments is quite as perfect as California. We don't have a mobility choice. That means we need to fix the water situation." Driscoll's, a family company, looks one or two generations out when planning and forecasting water needs. That means the current drought situation in California is quite worrisome, because water for farming will not be around for future generations if the aquifers are depleted. Agriculture is important to the California Central Valley, U.S. and world Because California produces much of the produce eaten in homes all around the U.S. and is fondly referred to as the nation's breadbasket. Due to the high cost of importing water from far away and the relatively low cost of produce, bringing in water from another region is not going to work economically. Agriculture is a big part of the problem and needs to be a big part of the solution California's approach to water rights has historically focused on longevity, and doesn't necessarily incentivize efficiency measures. That needs to change, given that the agriculture industry accounts for 80 percent of the water use in the state. To put these goals into action, Driscoll's established a formal forum for dialogue and collaborative projects with more than 50 community leaders from the Pajaro Valley, so that people could collaborate on ways to save water. "We're a family-owned company; we look out over one or two generations. This legislation is in the public interest. It's in California's interest to have water management. California was the only state that didn't have groundwater management." He claims he didn't get flack from other farmers because they knew legislation was in their industry's best interest over the long term, even if it caused short-term pains. In addition to water management, Reiter called for a carbon tax, which could raise the cost of production as it would increase the cost of oil. "Cheap food is one of the problems in our country," he explained, alluding to the fact that agriculture subsidies go mostly to corn and soybean growers in the Midwest, who produce cheap and copious ingredients for calorie-rich food without much nutritional value. 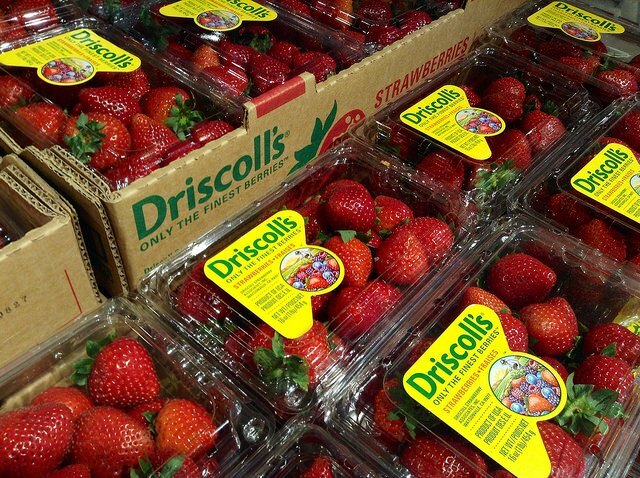 Driscoll's is hard at work figuring out how to efficiently produce berries with a minimum input of water without sacrificing taste or volume. In fact, Reiter pointed to taste as a key to healthier eating: "Fruit needs to taste better: We can shift people to healthier diets if the product tastes good." He joked that even his children won't eat berries that aren't tasty. To close things out, Reiter called on the culinary world to "get more creative with plant-based food. Animal-based entrees are a cop-out for poor skills." While many gourmands would probably disagree with Reiter there, there's no doubt that reducing meat consumption is one quick way to save water and improve health outcomes. Does that mean strawberry shortcake for dinner this summer?